New York State Clamps Down On Herbal Supplements : The Two-Way The state attorney general asked four major retailers to pull pills because they don't contain what they claim. Tests show supplements are often filled with cheap ingredients, including houseplants. DNA tests were run on supplements claiming to contain ginko bilboa, St. John's wort, ginseng and echinacea. If you are looking to herbal supplements to help improve your memory or vitality or help you to sleep, you may want to save your money. 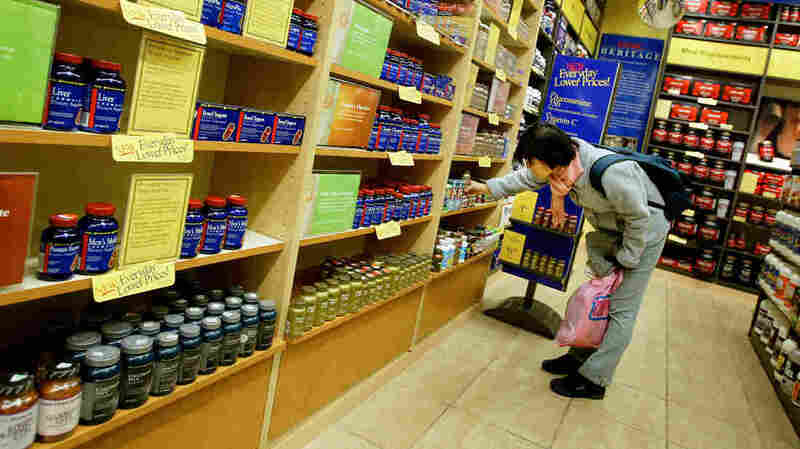 The New York State attorney general's office is asking four major retailers — GNC, Target, Walmart and Walgreens — to stop selling herbal supplements after tests found that many of them did not contain the herbs listed on their labels. In a press release, New York Attorney General Eric T. Schneiderman said DNA tests were run on supplements claiming to contain ginko bilboa, St. John's wort, ginseng and echinacea. Samples of the supplements were purchased from various locations around New York, and each sample was tested five times. In four out of five cases, the tests showed that the pills contained nothing more than fillers such as asparagus, rice, wheat or houseplants. "This investigation makes one thing abundantly clear: the old adage 'buyer beware' may be especially true for consumers of herbal supplements," said Schneiderman. He added that the herbal supplements "also pose unacceptable risks to New York families — especially those with allergies to hidden ingredients." Schneiderman says mislabeling, contamination and false advertising are illegal, and he's asking each company to provide more detail on the production, testing and quality control of the herbal supplements sold at their stores. Walgreen immediately agreed to the attorney general's request to pull the supplements off their shelves. Walmart said it would reach out to its suppliers and take appropriate action. GNC told the New York Times that the company would cooperate with the attorney general "in all appropriate ways," but that it stood behind the quality and purity of its store brand supplements. The response from the herbal supplement trade association, the Council for Responsible Nutrition, was not as supportive. It called the attorney general's actions a "sting," and described them as reckless, which "smack of a self-serving publicity stunt under the guise of protecting public health." But David Schardt, senior nutritionist of the Center for Science in the Public Interest says, "the evidence for these herbs' effectiveness is sketchy to begin with." Schardt, quoted in the attorney general's press release, says if the advertised herbs are in many of the products, it's a sign the "this loosely regulated industry is urgently in need of reform." The US Food and Drug Administration requires companies to verify their products are safe and properly labelled. But a federal law was passed in 1994 which exempted herbal supplements from following the same stringent guidelines. The New York Times says the chief architect of that law was Republican Sen. Orrin Hatch of Utah. The newspaper says Hatch "has accepted hundreds of thousands of dollars in campaign contributions from the industry and repeatedly intervened in Washington to quash proposed legislation that would toughen the rules."